Ever since the Twilight series (excuse me, SAGA) ended (mercifully), film producers have done their best to bring a new teen/young adult book series to the screen for a successful franchise. Percy Jackson and Chronicles of Narnia have stumbled, The Host flat-out bombed, as have Eragon, The Golden Compass, City of Ember, The Seeker: The Dark Is Rising, Inkheart, Alex Rider, Cirque du Freak, I Am Number Four, and The Mortal Instruments. Only The Hunger Games has managed to be successful both financially and critically (though not with me, who found it all so overrated, even a touch sadistic). While there are more coming down the pipeline (who needs to read junk by Harper Lee, Jules Verne, or Charles Dickens...we've got Stephanie Meyer! ), we now go to Beautiful Creatures, the first of a series of novels by Kami Garcia and Margaret Stohl. Not having read the books (given I'm not a teenager or a girl), I am unable to say how the film adaption is close or 'divergent' from the source material. 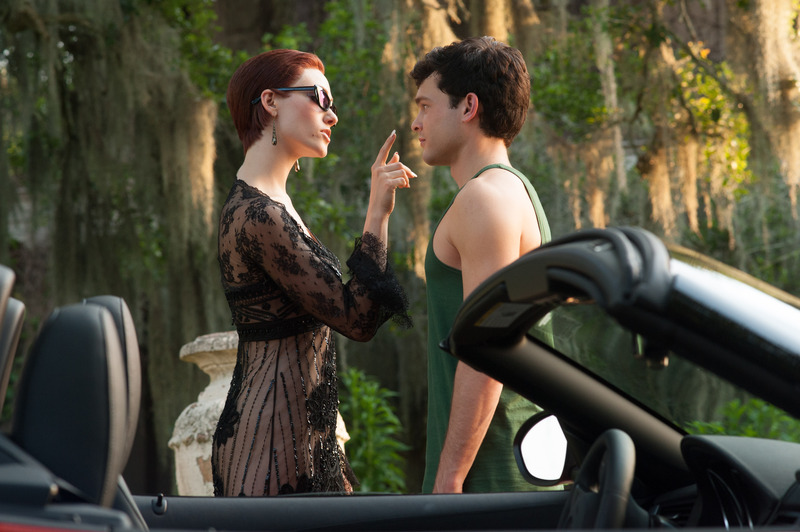 However, seeing the film I cannot help think that if it is near to the book Beautiful Creatures must be a howler of a read, hilarious, almost idiotic; in short, something teen girls would lap up but those who ended puberty long ago would think was just so much trash. Told in voice-over by Ethan Wate (Alden Ehrenreich), we go to the hick Southern town of Gatlin, South Carolina. We know Gatlin is Hick Central because, as Ethan tells us, there are 12 churches and 1 library (which has fewer books because the town has banned so many of them). Even worse, the local movie house gets the latest films months after they are released and never spells the titles right (for example, there's the Leonardo DiCaprio film Interception). THEY DON'T EVEN HAVE A STARBUCKS! Oh, the humanity! Still, Ethan is a rebel...he reads! For pleasure! Even the 'forbidden books' like Slaughterhouse-Five and Catcher in the Rye. His mother has died and his father has become a recluse...so much so we never see him in the entire film. Only old family friend Amma (Viola Davis), the town librarian, comes to supply them with food. Because that's what a librarian in a town whose books have to be approved by 12 denominations (and I'm assuming they are not Catholic churches, let alone Jewish synagogues) does with so much free time on her hands. Ethan has one best friend, fellow quasi-rebel Link (Thomas Mann), who shows his bad side by wearing a hat. 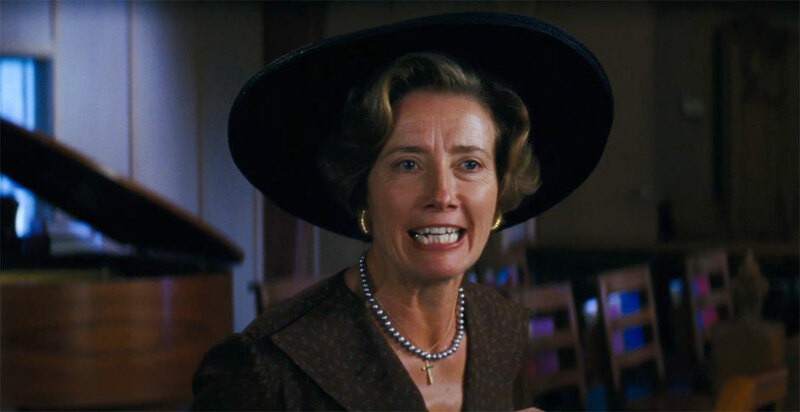 Link's mother, Mrs. Lincoln (Emma Thompson) is the local Christian fanatic, which in a town like Gatlin makes her middle-of-the-road. Enter into this town Lena Duchannes (pronounced Du-canes) (Alice Englert), niece of local bigwig Macon Ravenwood (Jeremy Irons). Many in town think Ravenwood is some kind of demonic force, but Ethan sees Lena as something special. She quotes books and isn't like the other girls in town (who break out in prayer at the drop of a hat). The girls openly tell the class that Lena is a witch and pray for protection, right after they object to reading To Kill A Mockingbird (for the first time in decades, apparently), because their church thinks it's evil. Where do they worship: the Church of the Poisoned Mind? ﻿﻿﻿﻿﻿﻿Well, we find that Lena does indeed have some kind of power. Lena discloses that she is a Caster, a witch who at 16 will have to be claimed either by The Light or The Dark. They have no choice in the matter, unlike the men who can switch sides. Let's put aside the sexism in all that. Ethan, however, will not be dissuaded: he has fallen in love with Lena, and despite being a mortal, she with him. This will cause problems because Casters cannot love Mortals. Complicating matters (yes, there are more complications), Ethan and Lena may be connected to an ancient Caster curse. Throwing in more things (seriously) is the wicked sister Ridley (Emmy Rossum), who wants Lena to go to the Dark, as does their mother Sarafine (identity too idiot to believe). With a little help from Amma (who is also the Caster Librarian) and her family, Lena goes to the ceremony and in the end, the lovers are united, though not without some upcoming troubles. I cannot help think that when director Richard LaGravenese was adapting the book he must have either decided that it wasn't worth the effort to try to make sense of any of this, but also decided he wasn't going to send it up either. Instead, we get an odd mix of the ridiculous and the romantic, where a dozen bad decisions offset one or two good ones. For example, the fact that Gatlin was some sort of backwater could have been handled better than by having the local theater misspell titles that the poster could have verified. That already was bad enough, but the portrayal of the local Christian community is downright bigoted; there is no other way of putting it. If it were any other group (Jewish, Islamic, Sikh, Hindu), there would have been a great outcry due to the cartoonish imagery of anti-intellectual, unhinged, ignorant characters. Take a gander at this doozy of dialogue spoken by Mrs. Lincoln, "God our Creator will condemn you (Macon) to hellfire along with terrorists, atheists, homosexuals, Democrats, liberals, Socialists, Greenpeace, and all the other unnatural abominations." Seriously, WHO TALKS LIKE THIS? Certainly no Christian I know...some who ARE Democrats, liberals, and Socialists. In any case, this is such a hilarious line, not just because it goes so wildly over-the-top with the venom, but also with the lousy acting by so many in the cast. The two 'Christian' girls just said the lines (I didn't bother to learn their names). We already touched on Emma Thompson, who judging by this has never actually met a functioning Christian is she thinks they do nothing but scream and pray at all hours of the day. She was a caricature OF a caricature. Irons either gave a Southern accent the best try he could or decided he just needed some money, because he sounded as Southern as Maurice Chevalier. Mann, an actor I genuinely like, had very little to do, and his character's actions lead to uncomfortable questions of logic (like if Ridley can seduce him so easily, why not do that with Ethan to get Lena to the Dark?). However, there were some good performances. Rossum was delightful as the deliciously wicked Ridley. Similarly, both Ehrenreich and Englert worked well as the star-crossed lovers (and much better than the material, which was just unbearably stupid). There were even some good quips, like when Amma tells the lovers that the Caster Library was once in Washington, D.C. until Nancy Reagan chased them away. The First Lady was the only Mortal the Casters were ever afraid of. However, they were done in by some lousy and muddled storylines where things happen and people appear for no real purpose. There is for example the character of the Ravenwood brother Larkin (Kyle Gallner), who pops in twice but somehow was vital to the 'twist' at the end of Beautiful Creatures. It is not fair to the non-reader to have a lot hinge on a character whom we are barely introduced to. Even worse, what I imagine in the book was a tense and dramatic moment turns into something wildly hilarious. The dinner scene where Ridley and Lena have it out will be remembered as one of the best unintentionally hilarious moment of 2013. The family is dressed like they came from a Hunger Games cosplay, when the two witches cause the table to start spinning. Some of the family continue eating while others demand they stop the table, while poor Ethan is kept there, forced into silence by Ridley, having to witness this wild scene. I was howling with laughter at all this, with it being more comical than anything. All of this supernatural teen romance crap is getting even more annoying. If you can't tell, I am not planning to watch this movie.